Acer’s ‘Explore Beyond Limits’ branding is being put to the test with a Star Trek-themed competition for UK consumers. 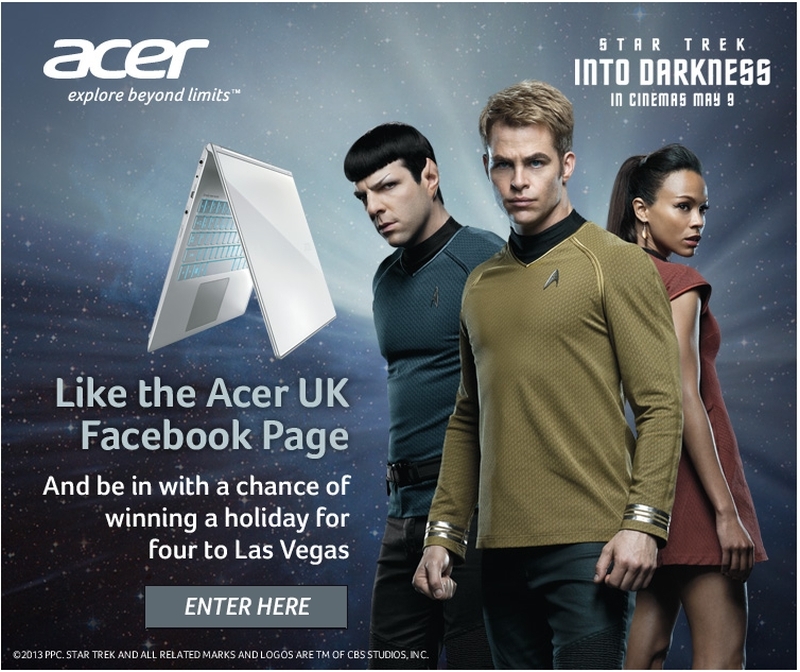 Anyone who logs onto the Acer UK Facebook and visits the Star Trek Into Darkness page between now and 30th June 2013 has the chance to win a holiday for four to Las Vegas. And if you’re worried that doesn’t sound as out of this world as you might expect, trust us you’ll need to ‘boldly go’ to handle some of the extra features. The prize includes a breathtaking helicopter ride over the Las Vegas skyline and dinner at the futuristic spaceship-styled restaurant Firefly. Shiny. But the real thrill is that you’re staying for four nights at the 900ft-high Stratosphere hotel, and it has its own theme park – 900ft up! It takes the kind of bottle Star Ship captains need to step onto these rides, as they thrust you over the side of the tower and show you the ant-like people below. If you see some fingernail marks in the back of the handrails, they’ll be from the last time we were there. Star Trek Into Darkness opens in UK cinemas on 9 May 2013. It stars John Cho, Noel Clarke, Benedict Cumberbatch, Alice Eve, Chris Pine, Simon Pegg, Zoe Saldana, Zachary Quinto, Karl Urban and Peter Weller.